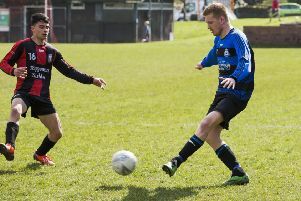 Midgley boss Craig Gee has called on his side to put a run of form together ahead of their Premier Division clash with Copley in the The Haslem Sheppard Halifax & District AFL. Gee’s men sit fifth in the table after an inconsistent start to the season, which has seen them knocked out of Skircoat Green Physiotherapy Challenge Cup by Warley Rangers, but progress in the West Riding Challenge Cup last week against Salem. Gee is keen to kick start a run of results, beginning with a win against Copley, which could see them rise to second in the table. He said: “We need to put a run together, it’s as simple as that, maybe for 10 games and we’ll see where we are after that. Copley go into the game on the back of an impressive 3-2 in at Mixenden, who lost for the first time this season. The Midgley boss was pleased with his team’s 5-1 win at Division One Salem last weekend. “It was an easy win really,” he said. “We would have been disappointed had we not. Tom Booth got the first of his two goals with a smart finish from about 12 yards to open the scoring. Greg Spink doubled their lead from the edge of the box before Marvin Bonnie made it 3-0 at the interval with a good finish into the bottom corner. Salem pulled one back with a header from a superb cross, but Midgley pulled away thanks to James Yates, a great finish after some neat link-up play, and Booth’s second, a shot into the bottom-right corner. Gee believes Midgely should be in as good a shape as they have been all season for the Copley match. Andrew Wilkinson and Jason Cartlidge are both available, as is Liam Brompton, who has been unavailable for the past week with a toe injury. Tom Booth has also provided Gee with a welcome boost after coming through the last two weeks unscathed following a month out with a hamstring injury. Midgley will close the gap on league leaders Calder 76 with a win, as they are in cup action against Halifax Irish. Hebden Royd Red Star host Northowram after they were knocked out of the county cup on penalties by Ventus Yeadon Celtic.